R & J has been providing quality homesites in and around Saline County, Arkansas for over twenty years. R & J Investments was founded by W. Ray Gabbard. I, Steven Ray Gabbard, now serve as president. I have been raised in the homebuilding industry and have worked in it since I was fourteen years old. I have been in a manager/owner position for the last eighteen years. To this day, I continue my family's tradition of incorporating honesty, quality, and integrity into every subdivision we develop. Our completed projects include Hickory Ridge, Spring Creek Village, River Oaks, Hartford Hills and Copper Creek. Our current projects are Coldwater Creek, Quapaw Estates and Countryside Estates. 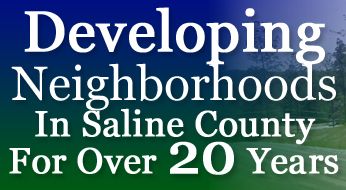 We are proud to develop our subdivisions without using Special Improvement Districts. We have been a member of the National Association of Home Builders, Arkansas Home Builders Association and very active within the Saline Home Builders Association for over 20 years. I have recently finished a second term on the Saline County Homebuilders Association Board of Directors including one year as President. We are also members of the Benton Chamber of Commerce. We firmly believe that we have a responsibility to return something to our community. We do this by sponsoring educational opportunities for local youth and donating to a variety of local charities. Copyright © 2011 R&J Investments, Inc. All Rights Reserved.